Jason Johannisen provided massive run for the Bulldogs, recording a game high 42 disposals and 826 metres gainedover 200 more than the next highest player in Jack Macrae. His 42 disposals is his highest tally this season - 10 more than his next best. Seb Ross was clearly the Saints' best player in the loss, recording team highs for disposals (40), contested possessions (10), score involvements (10) and metres gained (561). His 40 disposals was 13 more than any teammate and his highest tally in 2018. The Saints lead inside 50s 179 this quarter but has cost themselves in front of goal, scoring 2.5. Jade Gresham and Jack Billings have been the worst accuracy offenders, kicking 0.3 and 1.3 for the match respectively. Seb Ross has continued his impressive performance, recording eight disposals at 88 per cent efficiency so far this quarter. He has 13 more disposals than any other teammate. After booting eight goals in the third quarter, the Bulldogs have a solitary behind so far in the last quarter. They have conceded 13 inside 50s in this time. The Saints have started this quarter strongly, recording the last five inside 50s with a superior kicking efficiency of 20 per cent. Since being goalless in the first quarter, the Bulldogs have booted 14 goals in two quarters. They have also had four players record 20 or more disposals in that time, compared to the sole Saints player in Seb Ross. The Bulldogs have dominated this quarter, leading disposals by 42, inside 50s by 10 and outscoring the Saints by 49 points. Marcus Bontempelli has had 10 disposals and booted four goals straight this quarter alone. 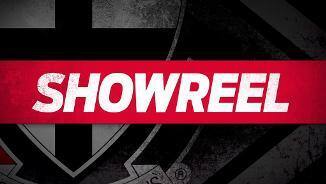 Bulldogs InterchangeJordan Roughead off due to an injury. Jason Johannisen has racked up 10 disposals already this quarter. He has 29 for the match and also leads metres gained for the match. The Bulldogs have now kicked the last four goals. 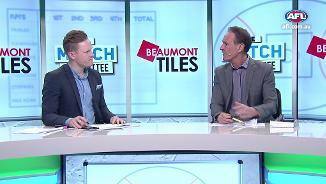 They have scored 26 points from stoppages for the match, compared to St. Kilda's seven points. Saints InterchangeTom Hickey off due to an injury. The Saints have started this quarter strongly with five inside 50s in the first seven minutes, but have let themselves down in front of goal with 0.4. The Bulldogs have rectified their accuracy in front of goal, booting 5.1 this quarter. They've outscored the Saints by 11 points this quarter despite having two less inside 50s. 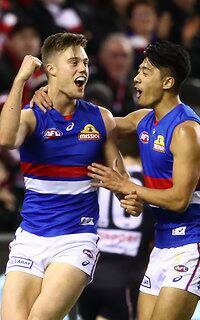 The Bulldogs have wrestled back the ascendancy at the stoppages, winning the last five clearances. Hunter and Dunkley have had two each in that time. The Bulldogs have come to life, kicking three goals in the space of three minutes. Macrae leads the charge with eight disposals and three score involvements this quarter. The Bulldogs have had three of the last four inside 50s but again failed to convert, scoring a solitary rushed behind from those entries. The Saints are continuing their control of the match, leading disposals 3617 and inside 50s 6-1 this quarter. 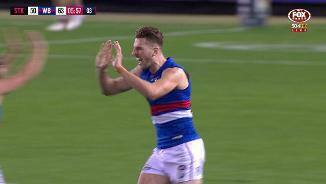 That last inside 50 brought up the Bulldogs' first goal against the run of play, after the Saints had recorded the previous five inside 50s and the last five clearances. The Bulldogs' inefficiency has cost them this quarter, equaling the Saints for inside 50s at 11 each, but only five behinds to show for it. The Saints have been applying superior pressure so far, leading tackles 179. Seb Ross leads the charge with three tackles and nine pressure acts. Bulldogs InterchangeRoarke Smith and is possibly out for the game. Saints InterchangeJosh Battle and is possibly out for the game. Welcome to Etihad Stadium for the St Kilda v Western Bulldogs Round 20 clash. 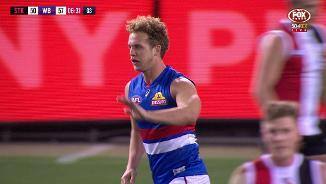 A STUNNING four-goal third quarter from Marcus Bontempelli has led the Western Bulldogs to a comfortable 35-point win over St Kilda on Saturday night at Etihad Stadium. The Bulldogs were goalless in the opening term and trailed by 28 points early in the second quarter, but piled on 14 goals to three after the first break to set up a 15.13 (103) to 9.14 (68) win. While neither side will feature in September, it was a well-earned win for Bulldog supporters who have endured a tough season, singing their song for just the second time in the past 11 matches. Bontempelli, splitting his time between the centre square and the forward line, was one of the Bulldogs' best after half-time, finishing with 21 disposals and the four goals. Others to star were the tireless Jack Macrae (36 disposals ) and Josh Dunkley (34), while Jason Johannisen's run-and-carry off halfback was extremely influential in the third term, amassing 42 touches and five inside-50s. For the Saints, Seb Ross was dominant in the first half, floating across the ground at will and gathering 21 disposals to half-time. He finished with 40 touches and three goals, including nine marks. It was a tough match to debut for St Kilda midfielder Nathan Freeman, who had finally overcome years of hamstring injuries to play his first game, 1718 days after being drafted in 2013. Freeman, playing predominantly on the wing, had a respectable 19 touches. Jake Carlisle was an immovable object across halfback early, with 12 disposals and seven marks in the first term alone. The game wasn't without its injury concerns, with both teams losing a player to concussion in the opening quarter. Bulldog Roarke Smith's unlucky run continued after missing last week suffering the effects of a car crash, while Saint Josh Battle accidentally clashed heads with noted hardnut Dale Morris. 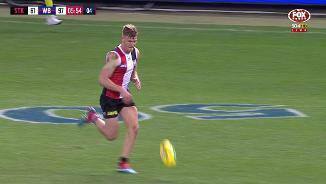 St Kilda ruckman Tom Hickey spent time off the ground with a hamstring complaint, and was clearly hampered, leading Carlisle and the unlikely Blake Acres to take the ruck contests. Hickey returned halfway through the final term, standing in the goalsquare to help with rotations. 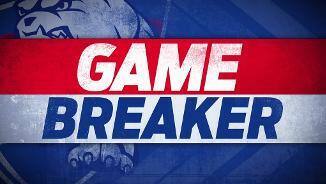 After the Bulldogs burst to a 45-point lead at three-quarter time, the game meandered to a close, with skill errors and missed shots on goal from both sides marring what had been an entertaining, if see-sawing, contest. 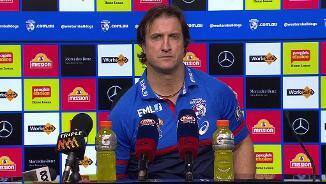 Bulldogs coach Luke Beveridge was pleased his players stayed composed and didn't panic about the fact they were behind on the scoreboard. "I didn't think the players came off their intent, so it was just a matter of staying composed, sticking to pre-match plans [and] not throwing the baby out with the bathwater. 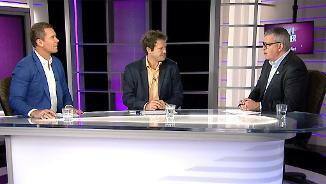 So we had a good conversation at quarter-time around all of that," Beveridge said. 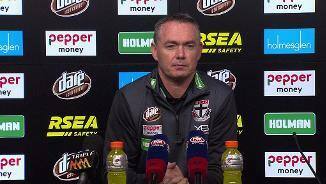 "To our players' credit, we've been under a little bit of duress around consistently playing the four quarters. I don't think it was the intent that cost us, it was just more the method and some of the Saints’ good play. I don't think we've had a third quarter like that for a long time, so that was nice." 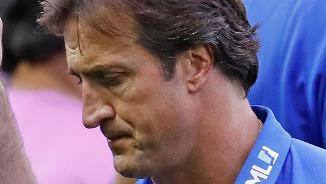 A subdued Alan Richardson said his Saints were "poor". "It was a very disappointing performance," Richardson said. 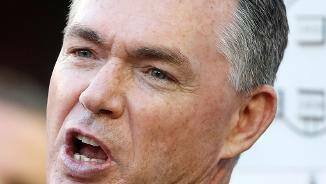 "It just lacked any sort of response when the Doggies took it to another level. St Kilda had taken advantage of some early Bulldogs misses, kicking four goals to take a 21-point lead into quarter-time. But the Saints seemingly ran out of steam after half-time, adding just two more majors while the Bulldogs romped home. 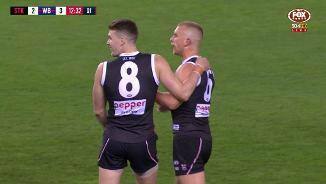 St Kilda: Josh Battle was ruled out with concussion early after an accidental head knock when Dale Morris bumped the Saint while he was kicking. Tom Hickey battled a lower-leg complaint throughout the match, spending time off the ground before planting himself in the goalsquare for most of the last quarter. 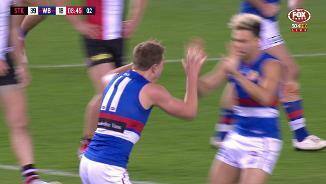 Western Bulldogs: Roarke Smith made a welcome return after being involved in a car crash last week, only to suffer concussion in a tackle in the first term. Roarke Smith has also been ruled out with concussion after this clash. A quirk of the fixture means next Friday night will be the first time St Kilda will meet an Essendon desperate to keep its faint finals hopes alive at Etihad Stadium. 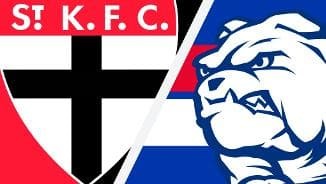 The Bulldogs will be keen to salvage some pride against North Melbourne in the early game on Sunday afternoon at Etihad, having lost by just two points last time the two sides met.